After weeks and weeks of every detail of the Galaxy S9 and S9+ leaking on the interwebs, Samsung has finally unveiled the primo Android flagships devices at their Unpacked event in Barcelona today. The Galaxy S9 and S9+ follows Samsung's quiet iteration since the Galaxy S6. With the Galaxy S9, Samsung has made the camera its focus supping it with a low-light optimised variable aperture (f/1.5-f/1.9) which is quite rare in the smartphone world at the moment. The camera also packs a super slow motion mode capable of capturing a groundbreaking 960fps slow motion video. It also packs a stereo speaker setup which is a first in the samsung world. Another feature that the camera is capable of is animated emojis or AR Emoji which is a cross between Snapchat's Bitmoji and Apple's Animoji. 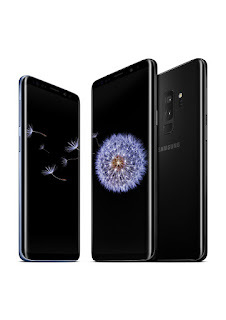 Specs wise, the Samsung Galaxy S9 and S9+ would pack a Qualcomm Snapdragon 845 processor in the US or a Samsung made Exynos 9810 everywhere else. 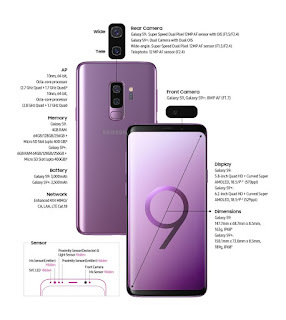 In addition it has a 4GB or 6GB RAM configuration depending on if you're going with the Galaxy S9 or S9+. There's the Samsung ever present IP68 water resistance, 3000mAh/3500mAh battery with wireless charging, a headphone jack. The Samsung Galaxy S9 and S9+ comes with Android Oreo with Project Treble support. The Samsung Galaxy S9 is expected to come in Titanium Gray, Midnight Black, Lilac Purple, and Coral Blue and would be priced at $720/£739/€849 for the unlocked Galaxy S9 and $820/£869/€949 for the unlocked Galaxy S9+.